Today's post is just a quick one to show you my recent work because I just fell in love with the combination. 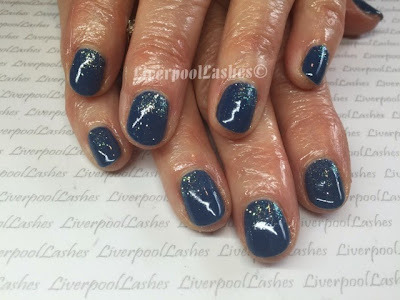 Jo books in for her nails every other Monday and as time has got on I really know the sort of shades she likes (generally colours like CND Shellac in Cocoa which is her absolute favourite) but every now and again she will surprise me like this appointment where she said that she fancied blue. Within moments she had chosen CND Shellac in Blue Rapture with Lecente Golden White Glitter over it. Originally she was going to have the glitter all over but I showed her what it looked like in an ombre effect and she loved it. Lecente Golden White Glitter looks fantastic over any shade but over the blue it gives an amazing green and gold shimmer. Please make sure you're following my Facebook page to keep up to date with my latest posts and tutorials.